Catherine supported by female companions, possibly Alessia. A Sienese local, Alessia was well acquainted with Catherine, and her spiritual goals, before 1370. Alessia was a fellow Mantellate woman and Catherine’s closest companion and friend. Alessia brought a high status to Catherine’s group because of her marriage into the noble Saracini family of Siena, and after her husband’s death, she joined the Mantellate. 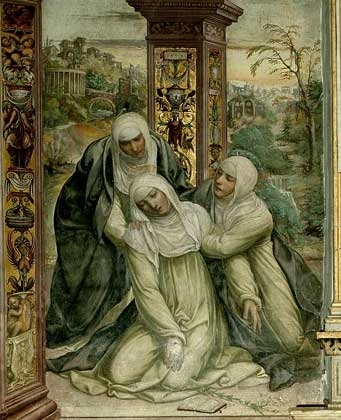 Alessia became a source of comfort and strength to Catherine. Before Catherine travelled around Italy, Alessia and Catherine already had a sister-like bond; Catherine often stayed in Alessia’s home rather than her own home where her parents were more controlling. This bond appears throughout Catherine’s letters and hagiographical writing post-mortem. Alessia acted as Catherine’s scribe occasionally and was Catherine’s choice as her successor to continue leading her family after she died.